Plymouth First Decade: How Fast Will It Go? While the my car was disassembled I became curious as to how fast it should be when it was back together. I have not seen contemporary performance numbers based on actual road tests published by American magazines. Apparently that type of new car coverage came later. There some numbers from British magazines but they are only valid for the car equipped with the small bore export motor and quite a different final drive ratio. [Motor 1933] states that the Chrysler Kew Six (basically a Plymouth) with a rear axle ratio of 4.875:1 was capable of achieving 56 MPH from a stand still in 21.4 seconds. It also lists a top speed of 70.87 MPH. But that engine was also about 13% smaller than the US version. So the highway engineer of 1942 assumed that the average car would take nearly 1⁄2 minute to accelerate from 10 MPH to 60 MPH. 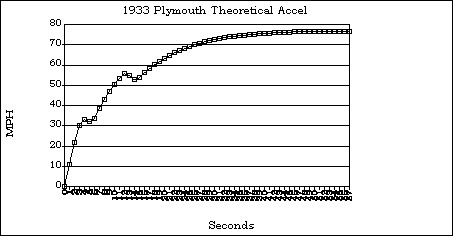 If the 1933 Plymouth could accelerate from 0 to 60 MPH in 29 seconds as reported by [AllPar 2001] then it was a very good performer in its day. The above information I found long after becoming curious about this item. And being a programmer by trade and a mechanical engineer by education, I set up a simple numerical integration model and fed it some basic data regarding the vehicle characteristics. Naturally, as with all computer output, this is subject to the GIGO (Garbage In, Garbage Out) situation. A lot of simplifying assumptions were made. Now that the car is back together, I have not tried to push it yet and find out how accurate my estimates were. But based on casual about town driving and a couple of trips where I ventured on to the freeways at speeds of up to 60, I think the model was reasonably good. The top speed is probably about right. The acceleration numbers are probably optimistic. Maybe some day I will get out with a stop watch and check the model for accuracy. Further assumptions: Weight of driver, fuel, etc of 300 pounds. Shift time of about two seconds (no synchromesh). No "red line" limit, shifting based only on horsepower. Acceleration run continued until no substantial increase in speed possible, that is until maximum vehicle speed is reached. Since a gasoline motor puts out no power at zero RPM, it is assumed that for road speeds that would require RPMs below 500 (idle) that the engine is running at 500 RPM and the clutch is acting as a 100% efficient torque converter.